OBJECTIVES: Recovery of the city waterfront to the lake. Historically there has been a tension between the growing city and the waterborder, resolved at first in a public space that worked as a waterfront. items of the intervention along the lakeshore. Connecting the lake and the forest. Both of them are the natural assets that Neuchatel proudly owes its existence to. Our aim is to create a permeable condition, both visual and in terms of pedestrian transport. Controlled growth of the city. The growth of Neuchatel has always been contained and respectful to the forest. Our intention is to create a City border born out of consensus and equilibrium with the mountain forest. This border shall allow the city to grow inwards along the next years rising the city density. Strengthening of the existing urban plot. The development of mixed uses/spaces. According to the competition basis, there are two lines of development. One, related to the lakeshore and the university and public facilities, whereas the second explores the way to a city growth along the forest fringe. The first line of development involves the idea of the city understood as a whole, continuous university campus, interconnected with service facilities and public spaces as well as with the residential districts by either pedestrian ways or the public transport network. It also implies the regeneration of the lakeshore waterfront, generating a green walkway and cycle lane. 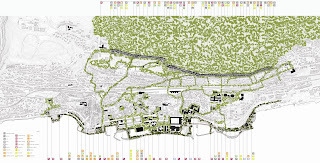 The second line of development, states a complex question: how should an already settled urban structure, with its border defined by a forest, with a slope which is difficult to cope with, define its strategy of growth? The most natural way to accomplish this task is the terraced growth, adjusting the level of the street to the ground level. This has been historically and all over the world geography, the most economic and simple solution to the problem of growth. 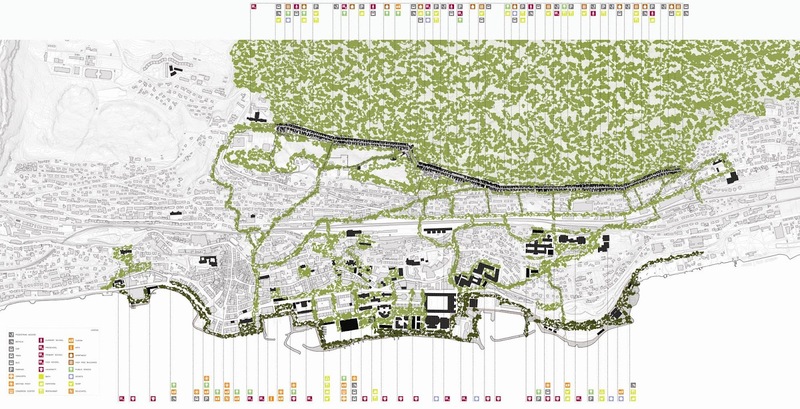 The border strip of city growth surrounds the protected areas, such as the botanic gardens, and encloses the "new potential growth area" for Neuchatel 2020. But this strip does not work as an homogeneous line. It consists of seven high density nodes, that we refer to as clusters. These clusters are strategically located, next to important connecting links with the railway station, the university facilities and sport facilities. All those clusters are connected by a street along which multipurpose mixed uses are placed. The removed trees in the forest fringe are taken to the waterfront, in the same amount but enhancing them by their location. Creation of park and ride spots and punctually in each of the proposed buildings. Bicycle lane is proposed that connects the university and educational buildings with the city.